Content marketing is hard. If it was easy, everyone would be doing it and doing it well (obligatory link). One of the lowest hanging opportunities for most businesses is simple – publishing on a schedule. If you look at the most trafficked blogs on the web, they have this in common. They publish consistently so that their followers know when to expect new content as well as what they will be talking about. So how often do blogs publish? Let’s take a look at a few. Smart Passive Income is a blog written by a well known blogger named Pat Flynn, who basically makes his income through different web properties that he owns and operates, most of which he sells advertising or uses affiliate links to monetize. As he goes through the motions of operating this business (and “passive” is a misnomer because he works very hard), he also teaches others how to do it. Pat has a podcast and does a lot of content other than just blogging (which is a lesson in and of itself in varying the types of marketing you do! ), but on his blog specifically he publishes twice a week. Sometimes it’s a blog post and a podcast, sometimes podcast and video, but he publishes twice a week almost without fail. Michael Hyatt is a blogger, speaker, entrepreneur, executive, and coach who I have followed for a long time. He used to be the CEO of Thomas Nelson Publishing, but since about 2011/2012 he’s been blogging and building his business online. Fun fact: I found some old WordPress forum threads with him asking for WordPress code help. How far he has come! Michael is a prolific writer and content creator, publishing three times per week. One of the things I respect most about him is his transparency around why. He used to publish five days per week but then realized that his audience was likely being overloaded, so he asked how often they’d want content and adjusted his frequency based on that. Ramit Sethi’s I Will Teach You To Be Rich is way more than just a blog these days. 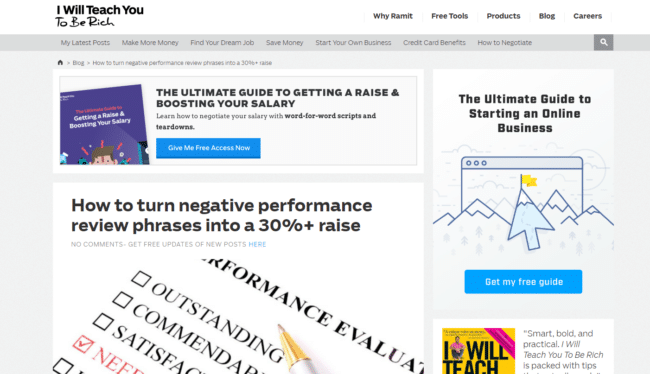 They have many premium courses, such as around copywriting, finding your dream job, launching a new business, building a consulting business, and much more. Over on the blog, though, they publish at minimum every Friday and sometimes more often during the week. Look through the archives and you will see that it has been forever since they missed a Friday publishing. 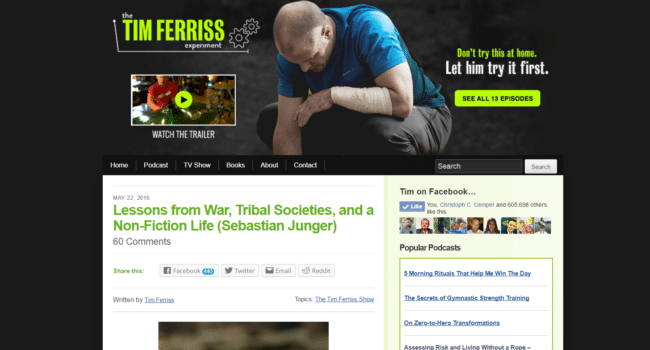 Tim Ferriss needs no introduction. The man wrote The Four Hour Work Week, Four Hour Chef, and Four Hour Body (books link), all of which hit #1 on the NYT Bestseller list. He’s well known for mini-retirements, his #1 business podcast, and his angel investing (Uber, Twitter, etc). His blog has a lot of gems on it about automation, remote living, learning, and more. These days, it’s mostly centered around his podcast and introducing his guests. While he has guest bloggers from time to time (all of whom have done amazing things), he (or his team) consistently puts new content on the blog at least once a week, usually Mondays when new podcast episodes come out. Darren Rowse is an Australian blogger who has been writing ProBlogger for years. As they say on the homepage, they have close to 8,000 posts on the blog covering topics like creating, starting, and monetizing a blog. 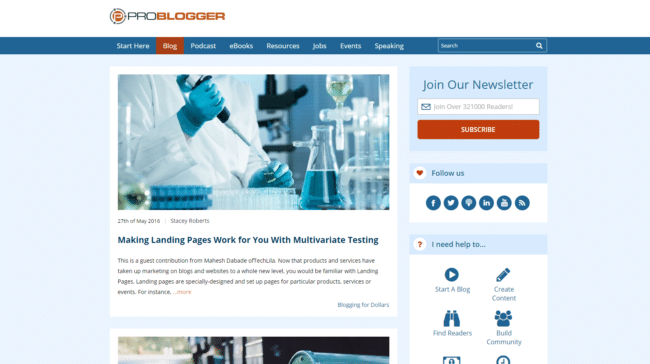 The ProBlogger blog allows bloggers to pitch to guest post as well. I even wrote one back in 2012. CopyBlogger is the creation of Boulder Colorado-based entrepreneur Brian Clark, who also hosts the Unemployable podcast (and runs a number of other businesses). Brian has been in the content marketing space since before it was called content marketing. As one of the earliest bloggers online, he built a fantastic following and has continued to branch into other areas as he sees the potential for new areas to make an impact. 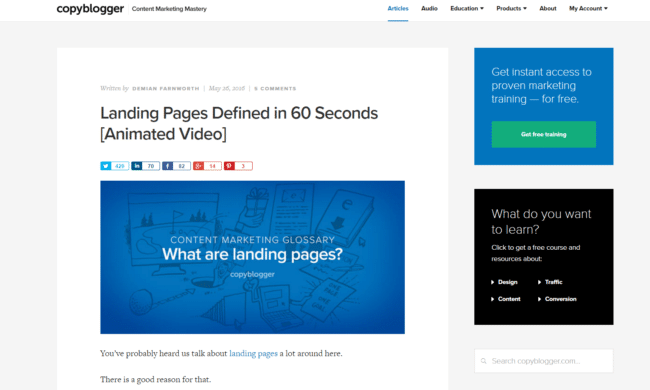 CopyBlogger the company also has the Rainmaker platform, which I hear is a fantastic platform for publishing and promoting your own content whether you blog, vlog, podcast, or any combination of the above. CopyBlogger the blog publishes every day of the week except for Sunday. @dohertyjf We historically did Monday – Friday, and only added the Saturday post because of @rainmakerFM. They have many various writers publishing on the site, giving it a wide range of voices and topics covered. What about you? How often do you publish and why? Do you want to become more consistent, and if so what are you doing to help that?